Unworthy. Ruth felt completely unworthy of all that Boaz had offered to her and she truly didn’t understand. 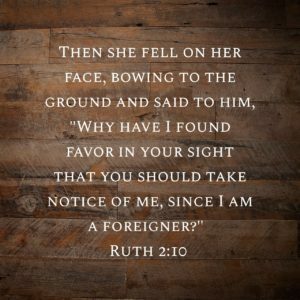 Read Ruth 2:10. She really doesn’t understand why Boaz has made the statements to her and promised to take care of her. She wants to know why because it just seems so odd that someone would, out of the blue, tell her these things. Do we feel worthy of all that God has promised us? It can be easy to take a look at the promises in The Bible and think, “Those have to be meant for someone else.” We know what we have done and we recognize that we are sinners, and yet God still loves us and still promises to care for us. The fact is, we are not worthy of all that God promises us, but He still promises these things to us anyway. He promises them to us because of His grace toward us. This has nothing to do with our worthiness or ability to accept these gifts. God’s grace is what gives us His promises, even when we don’t deserve them. God knows that we are unworthy. He makes a way for us to still experience His love and His grace regardless of whether we deserve them or not.